^ 1.0 1.1 1.2 Nice truck attack claims 86th victim. Star Tribune. 2016-08-19 [2016-08-23]. （原始内容存档于2016-08-21）. ^ 2.0 2.1 A Third of Nice Truck Attack's Dead Were Muslim, Group Says. New York Times. 19 July 2016 [23 August 2016]. ^ Isis claims responsibility for Nice attack as French police arrest 3 suspects. International Business Times. 2016-07-16. ^ Nice terror attack: Isil claims responsibility for Bastille day attack that killed 84 people. The Telegraph. 2016-07-16. ^ Attentat de Nice : ce que l'on sait du chauffeur, Mohamed Lahouaiej Bouhlel. Nouvel Obs. [2016-07-15] （法语）. ^ Nice Terror Attack: Truck driver shouting Allahu Akbar kills 84 on Bastille Day. The Sun. [2016-07-15]. ^ Boyle, Darren; Tonkin, Sam. Gun and truck attack leaves at least 80 dead in Nice: Men, women and kids strewn across road after lorry speeds for a MILE through holiday crowd watching fireworks, before gunman opens fire. Daily Mail. 14 July 2016 [2016-07-15]. ^ 8.0 8.1 Henderson, Barney; Graham, Graham. Nice terror attack: 80 killed by truck crashing into Bastille Day crowd and ploughing into pedestrians for up to 2km then spraying them with bullets. The Telegraph. 2016-07-14 [2016-07-15]. （原始内容存档于2016-07-14）. ^ 9.0 9.1 Breeden, Alissa J. Rubin, Adam Nossiter, Aurelien; Blaise, Lilia. Death Toll From Terrorist Attack in Nice, France, Rises to 84. The New York Times. 2016-07-15 [2016-07-15]. ISSN 0362-4331. ^ Nice truck attack: Islamic State claims responsibility. The Guardian. 2016-07-16. ^ Hollande confirms the end of a state of emergency after the Tour de France. [2016-07-14]. ^ Bergen, Peter. Truck attacks -- a frightening tool of terror, with a history. CNN. 2016-07-15 [2016-07-15]. ^ Higgins, Andrew. In Nice, a Vibrant Celebration Gives Way to a Trail of Death. The New York Times. 2016-07-14 [2016-07-15]. ^ 14.0 14.1 14.2 14.3 14.4 Nice attack: What we know of the Bastille Day killings. BBC. 2016-07-15 [2016-07-15]. ^ At least 74 killed as truck plows into crowd in Nice, France, on Bastille Day. The Jerusalem Post. ^ Willgress, Lydia; Samuel, Henry. Hero motorcyclist attempted to stop Nice terror attacker. The Telegraph. 2016-07-15 [2016-07-16]. ^ How the Truck Was Stopped. The New York Times. 2016-07-15 [2016-07-15]. ^ Almasy, Steve. Live updates: Truck driver attacks crowd in Nice, killing dozens. CNN. 2016-07-14. ^ Lorry have guns inside. BBC. 2016-07-15 [2016-07-15]. ^ 20.0 20.1 20.2 20.3 Attentat de Nice : ce que l'on sait du tueur du 14 juillet. Atlantico. 2016-07-15 [2016-07-15] （法语）. ^ Attentat à Nice : le suspect a été formellement identifié. Europe1. [15 July 2016] （法语）. ^ 23.0 23.1 23.2 23.3 23.4 23.5 23.6 23.7 23.8 23.9 Bastille Day attack in Nice. BBC. [2016-07-15]. ^ 24.0 24.1 24.2 Payton, Matt. Nice terror attack: Police arrest killer Mohamed Lahouaiej Bouhlel's wife. The Independent. 2016-07-15 [2016-07-15]. ^ Sini, Rozina. Nice lorry attack sparks false rumours on social media. BBC News. 2016-07-15 [2016-07-15]. ^ Who is the Nice terror attack suspect? Everything we know so far about Mohamed Lahouaiej Bouhlel. 2016-07-16 [2016-07-16]. ^ Here's What We Know About The Suspect in the Nice Attack. BuzzFeed. ^ France's Valls says Nice attacker linked 'one way or another' to radical Islam. Reuters. 2016-07-15. ^ 29.0 29.1 Breeden, Alissa J. Rubin, Adam Nossiter, Aurelien; Blaise, Lilia. Death Toll From Terrorist Attack in Nice, France, Rises to 84. The New York Times. 15 July 2016 [15 July 2016]. ISSN 0362-4331. ^ Jihadist Killers Drink, Party, Lead 'Western' Lifestyles As Disguise Before Attacks. www.breitbart.com. 2016-07-28. ^ 31.0 31.1 31.2 31.3 31.4 Nice Terror Attack Victims' Names And Nationalities Revealed After France Bastille Day Massacre. International Business Times. [15 July 2016]. ^ 32.0 32.1 32.2 32.3 Dozens killed during Bastille Day celebrations. BBC News. 15 July 2016. ^ The Latest: Truck is new dimension of attacks in Europe. WFIE. [15 July 2016]. （原始内容存档于2016年7月15日）. ^ Nice attack: Julie Bishop confirms three Australians injured in 'horrific' terrorist assault. Australian Broadcasting Corporation. [15 July 2016]. ^ Jones, Lloyd. Australia lucky again in Nice: ambassador. News Corp Australia. 16 July 2016. ^ 36.0 36.1 One Belgian among the victims in Nice. De Redactie. [15 July 2016]. ^ Müzell, Lúcia. Pelo menos dois brasileiros ficaram feridos em atentado em Nice [At least two Brazilians injured in Nice attack]. RFI Brasil. 15 July 2016 [17 July 2016] （葡萄牙语）. ^ Brasileiro é atingido na perna e ficará um mês sem andar, diz mãe [Brazilian had a leg injury and will stay one month on wheelchair, says mother]. Folha de S.Paulo. [15 July 2016] （葡萄牙语）. ^ Corpo de brasileira desaparecida em Nice é encontrado [Body of Brazilian missing in Nice is found]. O Globo. 18 July 2016 [18 July 2016]. ^ Two Chinese injured in Nice attack. Xinhua News Agency. [15 July 2016]. ^ Žádní Češi nezemřeli při útoku v Nice. Jedna Češka je zraněná. Zpravy.tiscali.cz. [15 July 2016] （捷克语）. ^ Two Estonian nationals killed in Nice. ERR. [19 July 2016]. ^ Kaljurand infotunnis: Nice'is on haiglaravil kolm Eesti elanikku. [Kaljurand in briefing: Three residents of Estonia hospitalized in Nice]. Postimees. [19 July 2016]. （原始内容存档于2016年7月24日） （爱沙尼亚语）. ^ 44.0 44.1 Venemaa konsul: Nice'i rünnakus sai kannatada kaks Eesti-Vene topeltkodakondsusega last [Russian Consul: Two children with Estonian-Russian dual Citizenship among the injured]. Postimees. [19 July 2016]. （原始内容存档于2016年7月24日） （爱沙尼亚语）. ^ Attentat de Nice, qui sont les victimes?. Direct Matin. [17 July 2016] （法语）. ^ Attaque de Nice : le point sur l'identité des victimes. Est Republicain. [16 July 2016] （法语）. ^ Terror in Nice: Details of victims emerge. WUSA. [15 July 2016]. ^ Who were the victims of the Nice truck rampage?. The Local (France). [15 July 2016]. ^ A külügyminisztérium egy magyar sérültről tud Nizzában. Origo.hu. [18 July 2016] （匈牙利语）. 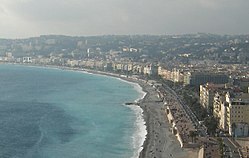 ^ Nice: 'Serious concerns' over Irishman caught up in attack. BBC News. ^ Frequente, Salvatore; Montefiori, Stefano; Ottolina, Paolo; Montini, Beatrice. Attentato Nizza: camion sulla folla e spari, 84 morti. «10 bambini uccisi» È stato un nizzardo di origini tunisine. Corriere della Sera. 14 July 2016 [19 July 2016] （意大利语）. ^ Strage di Nizza, la Farnesina conferma: sei italiani tra le vittime. la Repubblica. 19 July 2016 [19 July 2016] （意大利语）. ^ Chetyre kazakhstanki pogibli.. Nur.kz （俄语）. ^ Attentat à Nice – Deux Malgaches tués, quatre autres blessés. L'Express de Madagascar. 16 July 2016 [17 July 2016] （法语）. ^ Malaysian student injured in Nice attack. The Star. [15 July 2016]. ^ At Least Three Moroccans Killed in Nice Attack. Morocco World News. [15 July 2016]. ^ Derde Nederlandse gewonde na aanslag Nice. Nederlandse Omroep Stichting. 16 July 2016 [17 July 2016] （荷兰语）. ^ Dwie Polki wśród ofiar zamachu w Nicei. Znamy szczegóły. Onet.pl （波兰语）. ^ Uma família de três portugueses escapou por pouco ao ataque de Nice [A family of three Portuguese barely escapes Nice attack]. Público. [20 July 2016] （葡萄牙语）. ^ Copilul român rănit în atacul de la Nisa, găsit într-un spital. Părinţii lui sunt încă dispăruţi. Realitatea TV. 16 July 2016 （罗马尼亚语）. ^ Andrei Luca Popescu. Românul dispărut în atacul de la Nisa, găsit mort. Gândul. 19 July 2016. ^ Who are the victims of the Nice terror attack?. The Daily Telegraph. 15 July 2016. ^ Французская полиция подтвердила гибель еще одной россиянки в Ницце. RIA Novosti. 19 July 2016. ^ One Singaporean injured in Nice after attack: MFA. Today. 15 July 2016 [16 July 2016]. ^ What We Know About The Victims of the Attack in Nice. The Huffington Post. [15 July 2016]. ^ Кількість постраждалих українців у теракті в Ніцці збільшилась [The number of victims of the terrorist attack Ukrainian increased in Nice]. Ukrayinska Pravda. 15 July 2016 （乌克兰语）. ^ Nice attack: At least one UK national injured. BBC. 15 July 2016 [20 July 2016]. ^ Huard, Christine. FBI says Del Mar student died in Nice attack. U-T San Diego. 17 July 2016. ^ 70.0 70.1 Three Germans on school trip 'among Nice terror victims'. The Local (Germany). 2016-07-15 [2016-07-15]. ^ Berlin students reportedly among dead in Nice. DW.com. 2016-07-15. ^ Naar, Ismaeel. Many Muslims reportedly killed in Nice truck attack. Al Arabiya. 2016-07-15 [2016-07-15]. ^ Cockburn, Harry. Nice attack: Many Muslims reportedly among 84 killed by lorry. The Independent. [2016-07-15]. ^ Nice: 'Ma mère est morte dans l'attentat. Elle pratiquait un vrai islam'. L'Express. [2016-07-15] （法语）. ^ Berlin students reportedly among dead in Nice. DW.com. 2016-07-15 [2016-07-15]. ^ Two Americans Among the Victims. The New York Times. 2016-07-15 [2016-07-15]. ^ Russia Says One Citizen Was Killed and Another Was Wounded. The New York Times. 2016-07-15 [2016-07-15]. ^ 尼斯凶犯蓄谋已久 还有5名帮凶. 法廣. 2016-07-21. ^ CNN, John Sinnott. #PortesOuvertesNice: City reacts to terror. CNN. [2016-07-15]. ^ Mezzofiore, Gianluca. #PortesOuvertesNice offers accommodation for survivors of Nice attack. Mashable. [2016-07-15]. ^ #PortesOuvertesNice, le hashtag pour offrir et demander de l'aide. Le Huffington Post. [2016-07-15]. ^ Nice: Holland returned from Avignon and goes directly to the Crisis place Beauvau. [2016-07-14]. ^ LIVE. "Terrorist" attack in Nice: Holland will extend state of emergency. [2016-07-14]. ^ "Numerous victims" triggered the Orsec plan, announces Minister of the Interior. [2016-07-14].